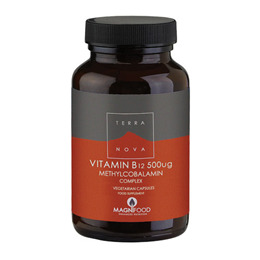 Vitamin B12 500mcg Methylcobalmamin Complex 100 Vegan Capsules. With MAGNIFOOD blend including Stabilised Rice Bran, Parsley, Dandelion, Beetroot, Ginger & Gentian. The holistic innovation developed by Terranova utilises whole, unadulterated, phyto-rich foods and botanicals, many of which are fresh freeze-dried. Each MAGNIFOOD ingredient has been carefully chosen to fulfil one or more functions including a) enhancing the bioavailability, utilisation and/or function of the product’s other ingredients; b) providing synergistic enzymes and co-factors which support the product’s micronutrient content; c) increasing the product’s overall nutritional activity; d) protecting the ingredients from oxidative damage and enhancing the product’s stability; e) supporting the product’s functions/applications. Research shows that fresh freeze-drying of plants is typically superior to other drying methods in retaining potency and preserving the plant’s original biochemical complexity. Fresh freeze-drying also offers high solubility (assisting absorption) and greater shelf stability. As a food supplement for adults, take 1 vegicap daily with food. Below are reviews of TERRANOVA Vitamin B12 500mcg Complex - 100 Vegicaps by bodykind customers. If you have tried this product we'd love to hear what you think so please leave a review. This is a product that suits us nicely and having done our research on B12 as a supplement, we would highly recommend this one to others.